Professors blogg: "Ich bin ein Moslem"
The Swedish "liberals", with the Folkpartiet and DN in the lead, call today for supporting the Danish government amind the wrong - or just alleged - assumtion on that Sweden is also under siege and attack by the angry reaction of world Moslems. It is a dubious stand against a remarkable Danish concept on both what "freedom of the press" should be, and how to cruellest humiliate their ethnic Muslim minority, an impoverished and exploited social group already ground-beaten by an unique structural racism. I am not at all religious (the gods knows that! ), and I am very much aware the kind of "contribution religion has made to civilization", to use the words of Bertrand Russell. However today I feel - as any other decent truly libertarian - in solidarity with the offended and the oppressed. Let us look to some facts on the alleged issue of "aggression" against Sweden. In the building where the Swedish embassy is allocated in Damascus, there are two other embassies. In the ground floor the Chilean embassy, on top of it the Swedish delegation, and only above the embassy of Denmark. In order to get to their target (the Danish representation), the angry demonstrators had to pass through the first two floors. Sweden was never, at least up to this moment, a conscious target for these attacks. This has been already made clear by Muslim militants for instance in Gaza, last week. Neither has been Chile, for that part. As a matter of fact, the Chilean media has taken a quite another stand than their Swedish counterpart. In Chile it was informed as it was that the Chilean and Swedish embassies were not the scope of the attack. A with this no further incitement to put Chileans against the resident Muslims in that country. It appears evident that DN, folkpartiet, and other interested sectors, are partly artificially twisting the facts (through the hiding of vital information, which alter the understanding of the picture as a whole), and partly artificially overreacting. But, why to care doing this? What is the hidden agenda? 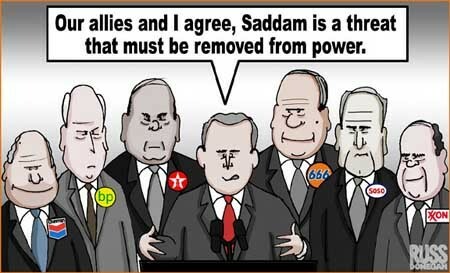 Some sort of NATO issue, preparing new alliances, getting "common" Muslim foes, or whose oil? Among the tricks it protrudes the one of “let us forget how the thing started, let us see instead the consequences of this aggression against Denmark, which is an aggression to us”. Since it was Denmark the party that unilaterally started the all thing with its conscious bizarre provocation, does not this part sound like a continuation piece of a dictated dramaturgy, a second act we all have to plug and play? And who do they expect to forget what? That Denmark - by decison of its political leaders- is one of the armed forced invading Iraq, on the ground of false acussations (the "weapons of mass destruction" issue) at the orders of Bush? That Denmark - even if not all Danes, or perhaps due to only some of them- is worldwide known by the cultural mistreatment (not only discrimination) the immigrants are subjected to? That "democratic" Denmark, its government and that infamous newspaper have shown an arrogance only parallel to the one showed by the worst totalitarian regimes against the minorities - ethnic, religious, or political minorities - of their time? If some at DN, and the Folkpartiet, and other Swedish interested sectors think that the globalization they have vividly supported is only one-directional, the facts of last week prove them catastrophically wrong. The western celular telephones now in the massive hands of seemingly uncontrolable crowds could spray, as a light in a tempest, true news as well as exagerated news or even plain rumors leading to desvastating acts. 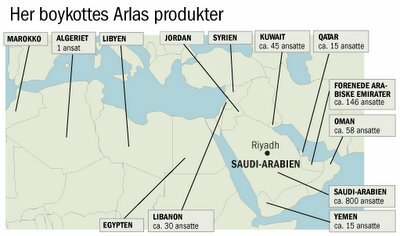 The regrettable economic boycott against the Danish Arla of these days (click on image below) may be the one of tomorrow against Volvo, JAS, Sony-Eriksson, AGA, and all kind of Miss Sweden or mister right and their respective music. For the sake of peace, reason, and the victory over religious fanatics of all latitudes, and the victory over the selfish politicians seeking confrontation by using "religion" or "freedom of speech" for the benefit of own agendas. In other words, for the sake of the civilized values you say to maintain. Do not argument, do not act as a narrow-minded chauvinist.